A few weeks ago I gave you the ten best third movies. With the release of the woefully unfunny The Hangover Part III, I thought it was time to dip into the bottom of the barrel and deliver the worst third movies, according to me. 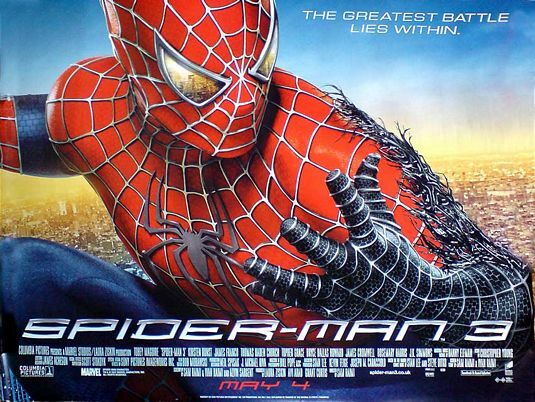 Sam Raimi had done a mighty fine job on the previous Spidey movies but came unstuck here with far too much plot as Tobey Maguire’s Peter becomes torn as the hero while Sandman and Venom just didn’t work. Not awful but when compared to number two, a huge disappointment. 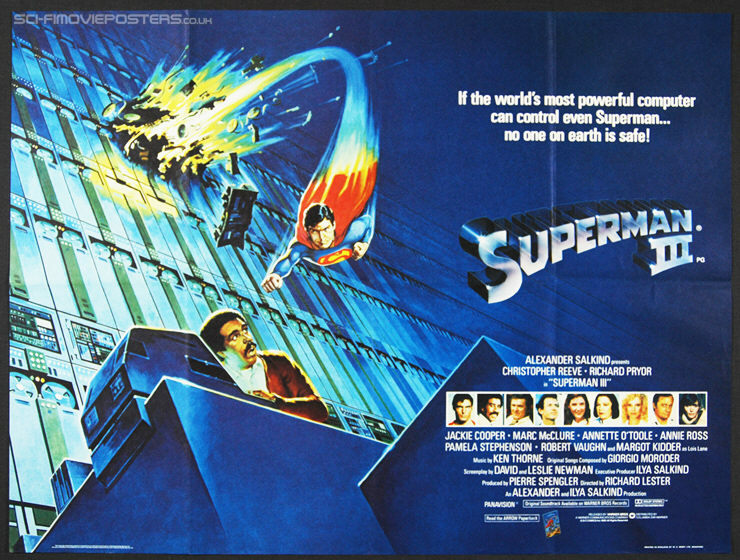 After the brilliance of the first two, this is when the franchise came crashing down as the focus shifted onto Richard Pryor’s annoying Gus and a group of unbelievable pantomime villains led by Robert Vaughn. The battle between good and evil Superman was a highpoint but the finale was a mess. Still, it was better than Quest For Peace. James Cameron’s baby was taken over by Jonathan Mostow and with only Arnie returning, it was always going to be a hard act to follow Judgment Day. A female terminator was added to try and jazz things up but this came across as a laboured rehash of the first two with nothing more to say. Some set pieces worked but on the whole it was been there, done that. 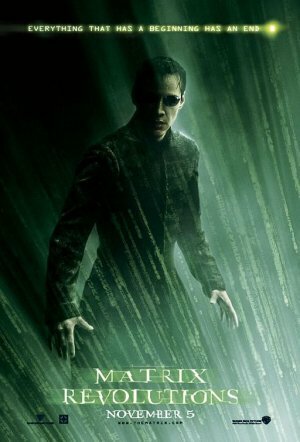 David Goyer had managed to do some good things with Blade, script wise but this uneven final entry, in which he also directed, tried to spice things up with the introduction of Ryan Reynolds and Jessica Biel as The Nightstalkers but with pacing and framing problems AND following Del Toro’s superb second film, it was never going to be easy. Eddie Murphy teamed up with director John Landis for this third outing of Axel Foley’s adventures and even though the pair had worked together successfully in Trading Places and Coming To America, this time Landis found Murphy hard to work with. With spiralling costs and a script that kept changing every few minutes, the film, which was suppose to be Die Hard at a theme park, soon became a poor entry and the start of Murphy’s slow demise. The most expensive film of the time, this had problems all over the place. Rambo taking on the Russians was suppose to be a statement about their involvement in Afghanistan but they withdrew before the film opened. It was heavily cut in the UK, some say due to the murders committed by Michael Ryan and so we have an incredibly violent mess of a film that kept Rambo off our screens for 20 years. The third outing of the increasingly complex ground breaking sci-fi series was made even more complicated by this mess of a movie where no one seemed to have a clue what was going on. Rambling on and on, the Wachowskis conclusion just made people come out lost and didn’t win over any fans or those who loved the first film. Even though Jaws 2 wasn’t a masterpiece, it was far better than this shabby entry with added 3D (the blue and red glasses, not the new Real-3D). The shark looked more rubbery as it attacked a marine theme park and Dennis Quaid is the man out to stop it. Unintentionally funny in places, luckily it didn’t distract from the greatness of the original. After winning Best picture with both his previous Godfather films and still hailed as the greatest cinematic series, Francis Ford Coppola decided to round off the saga with this lame entry that saw an aging Michael Corleone close to retirement. Pacino was as good as ever but the casting of Coppola’s daughter, Sofia, caused many to dismiss the film and compared to the first two, this was a pointless exercise. Michael Bay complained bitterly about the press reaction to his second Transformer movie and was determined to make a better third film. He didn’t. Instead we got a louder, messier and duller film than the rest, thanks to Megan Fox jumping ship and being replaced by an even less talented Rosie Huntington-Whiteley and bigger set pieces that just gave you a headache. Currently making number 4, it should have stopped at the first one.